The Post was the flagship newspaper of MediaNews Group Inc., founded in 1983 by William Dean Singleton and Richard Scudder. MediaNews is today one of the nation's largest newspaper chains, publisher of 61 daily newspapers and more than 120 non-daily publications in 13 states. MediaNews bought The Denver Post from the Times Mirror Co. on December 1, 1987. Times Mirror had bought the paper from the heirs of founder Frederick Gilmer Bonfils in 1980. 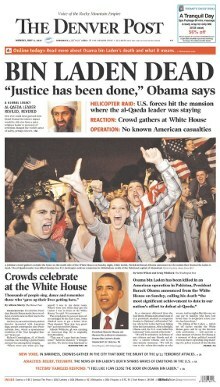 Through the use of sensationalism, editorialism, and "flamboyant circus journalism", a new era began for the Post. Circulation grew and eventually passed the other three daily papers combined. On November 3, 1895 the paper's was name changed to Denver Evening Post. On January 1, 1901 the word "Evening" was dropped from the name and the paper became The Denver Post. Among well-known Post reporters were Gene Fowler, Frances Belford Wayne, and "sob sister" Polly Pry. Damon Runyon worked briefly for the Post in 1905–1906 before gaining fame as a writer in New York. In 2013, just before legalization in Colorado, The Denver Post initiated an online media brand The Cannabist to cover cannabis-related issues. First led by Editor in Chief Ricardo Baca, the online publication has surged in popularity, beating the industry veteran High Times in September, 2016. Thirty layoffs were announced for The Post in March 2018, according to Denver Business Journal and The Cannabist is expected to cease in June 2018[needs update] with the departure of its last staffer. In 2017, The Denver Post announced that its headquarters were moving to its printing plant in North Washington, Adams County. 2015: Pulitzer Prize finalist in Explanatory Reporting for coverage of Colorado's marijuana laws. 2007: Four awards for outstanding business coverage from the Society of American Business Editors and Writers (SABEW). The project-reporting winner was the Post's 2006 series on Colorado's mortgage foreclosure epidemic, "Foreclosing on the American Dream". 2007: Former Post staff writer Eric Gorski was awarded first place in "Best of the West" contest in the Business and Financial Reporting category for "The Gospel of Prosperity", a look at the finances of the Heritage Christian Center. Radio Television Digital News Association's Edward R. Murrow awards, including Lindsay Pierce/“Kailyn’s Spirit” in 2016, three in 2015. 2013 The Carson J Spencer Foundation "Media All-Star" award for responsible reporting on suicide. In February 2014, The Denver Post began publishing a section entitled "Energy and Environment", funded by Coloradans for Responsible Energy Development (CRED), a pro–natural gas group. The stories in the section are written by outsiders, not by DP reporters. A banner across the top of the section reads "This Section is Sponsored by CRED". Nevertheless, critics express concern that the section risks confusing readers about the distinction between advertising and reporting. ^ a b Sanchez, Robert (October 2016). "How Massive Cuts Have Remade The Denver Post". 5280. Retrieved August 22, 2017. ^ "Top 25 U.S. Newspapers For March 2013". Alliance for Audited Media. 2013-04-30. Archived from the original on 2013-06-11. Retrieved 2013-06-09. ^ Petty, Daniel (May 17, 2016). "Denver Post unique visitors jump to 6.01 million, up 65 percent year-over-year". The Denver Post. Retrieved June 30, 2016. ^ Ember, Sydney (7 April 2018). "Denver Post Rebels Against Its Hedge-Fund Ownership". The New York Times. Retrieved 13 April 2018. ^ Ember, Sydney (12 April 2018). "Colorado Group Pushes to Buy Embattled Denver Post From New York Hedge Fund". The New York Times. Retrieved 13 April 2018. ^ McCartney, Laton (2008). The Teapot Dome Scandal: How Big Oil Bought the Harding White House and Tried to Steal the Country. Random House. p. 124. ISBN 9781400063161. ^ "Part 1: Early Runyon". Denver Press Club Historical Archive. Archived from the original on 2007-10-06. Retrieved 2007-06-20. ^ Riley, Marilyn Griggs (2006). High Altitude Attitudes: Six Savvy Colorado Women. Big Earth Publishing. p. 83. ISBN 978-1555663759. ^ Bill Hosokawa (1976) Thunder in the Rockies, New York: Morrow. ^ "Industry Bloodbath Continues: 'Denver Post' Loses 21 Posts in Newsroom". Editor & Publisher. Associated Press. 2007-06-19. Archived from the original on 2008-05-26. Retrieved 2008-06-28. ^ "Denver Post Cutting Staff". 9News Denver. June 4, 2016. Retrieved 16 May 2016. ^ "Cannabist surpasses High Times in unique visitors for first time". 12 October 2016. ^ Hendee, Caitlin; Avery, Greg (14 March 2018). "Massive job cuts coming to the Denver Post". www.bizjournals.com. Retrieved 2018-09-11. ^ Avery, Greg (27 April 2018). "Denver Post cuts hit The Cannabist, and its founder tries to mount a rescue". www.bizjournals.com. Retrieved 9 May 2018. ^ Roberts, Michael (2017-05-09). "Denver Post Moving Newsroom Out of Denver". Westword. Retrieved 2018-05-13. ^ New York Times (1989-12-01) "Denver Post Picks New Editor"
^ "Denver Post Editor Resigns". Denver Post. March 15, 2016. Retrieved 16 May 2016. ^ "Lee Ann Colacioppo named editor of The Denver Post". Denver Post. May 31, 2016. Retrieved 2 June 2016. ^ "2010 Pulitzer Prizes". www.pulitzer.org. ^ Cavna, Michael (April 18, 2011). "THE PULITZERS: Denver's Mike Keefe wins for Editorial Cartooning". The Washington Post. ^ "2012 Pulitzer Prizes". www.pulitzer.org. ^ "Shooting coverage wins Pulitzer". 3 News NZ. April 16, 2013. ^ Ostrow, Joanne (21 June 2016). "Denver Post videographer Lindsay Pierce wins National Murrow Award for "Kailyn's Spirit"". The Denver Post. Retrieved 9 May 2018. ^ "Denver Post takes home 3 national Murrow Awards". The Denver Post. 14 October 2015. Retrieved 9 May 2018. ^ "Denver Post receives Media All-Star award for responsible reporting on suicide". 23 August 2013. Retrieved 9 May 2018. ^ "The Denver Post's 'Energy And Environment' Section Is Produced By The Oil And Gas Industry". Wikimedia Commons has media related to The Denver Post.